I own a 2010 Trek District with a belt drive. I'm fairly happy with the setup, since after months of standing outside I just picked up the bike again and started riding without the usual chain maintenance. However, the problem I currently have is that under large torque, so e.g. accelerating out of traffic lights makes the belt either slip or jump off the rear cog. Riding in traffic with cars close-by makes this a somewhat dangerous mishap, so I'm hoping I could fix this. Even when pedaling with high cadence the belt seems to be moving outwards all the time, and can be fixed by pedaling backwards one round or so. The instruction manual and googled resources [broken link - try this trekdistrict discussion or this bike-manual link) claim that setting the correct tension and alignment to be easy, but I've found it to be quite a hard task. So, could someone with more bike mechanics skills and experience tell me how to do this or point me to a good resource? Is there an easy way to set the tension, without having a special tool for measuring the tension? How accurate does the tension have to be in order not to slip under pressure? How can I (easily) align the belt correctly for it not to travel right on the rear cog? Thanks in advance for any answers! I could probably take it to the local shop, but I've been trying to handle all and any maintenance myself, since this is a hobby after all. I've tried to adjust the tension and managed to get rid of the slippage, so the original problem is more or less solved. I've also tried and managed to tighten the belt too much, since it started to have a funny noise and the freewheel didn't seem to work correctly anymore. Now the tension seems about correct, but the belt still "travels right" (as in the image) and jumps off the cog, when accelerating. I'm starting to think that the rear hub is not perfectly straight with regards to the belt, but I would think one would notice this when riding. After nearly getting hit by a bus, caused by the belt jumping off the rear cog, I decided to bite the bullet and take the bike back to the shop. Turns out I have strong fingers, since the problem was too much tension on the belt. The high tension made the rear wheel not fit perfectly in the rear dropouts. This made the wheel just the slightest bit misaligned (what's the opposite of straight? ), which in combination with the tension made the belt to travel outwards when applying enough torque. Anyway, thanks for all the suggestions here, but from now on I suggest all the belt-drive people like me either get the real tools, or support the local bike dealer for the no or low maintenance of the belt drive. As to measuring belt tension, the tool is your best option. If you own the bike, then you should own the tool. Without it, however, place an S-bent spoke or similar wire in a hook over the center of the top of the belt. Add weight to the bottom hook. 10 pounds is the spec. Yes, this is a lot of weight for a bent spoke. Be creative. Or buy the tool. Place a ruler next to the belt, at the point of the weight's pull. Write down the measurement. Remove the weight. Measure again, in the same place. Subtract the first measurement from the second measurement. The difference should be between 5 and 12 millimeters. 10 millimeters is ideal. The alignment is dependent on the type of dropout. EDIT 1: The image below is a new tool from Gates, called the Eco Tension Tester, which does exactly as described above, in a more professional manner. Perhaps it will help describe the intent of the method I described. With the dropout style you posted in your image, the alignment is actually set with two things. 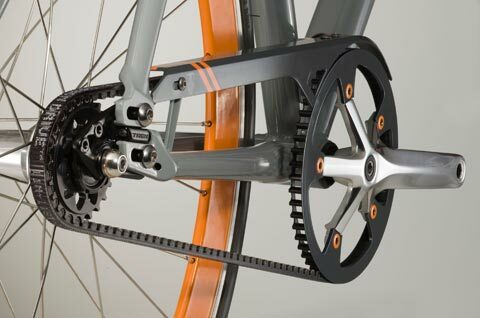 Wheel centering - the wheel needs to be equally centered between the chainstays. This is a do it by eye and feel job, although you can gauge your success by measuring from the rim's brake surface to the inside surface of your chainstay, assuming your wheel is properly dished over your hub. The second thing which affects the belt alignment on the pulley is your "chain" line. With the District, this alignment is set with the length of the bottom bracket spindle. The more perfect the chainline, the less likely you will have issues with the belt rolling off the cogs. Most bike shops have a tool like the Park Tool CLG-2 for measuring chainline accurately, although it is designed to work with a toothed cog. If you have consistent issues with the belt rolling off the cog, and your dropouts are evenly set up in the frame, and your wheel is centered, find an LBS to check your chainline. You may need to swap the bottom bracket axle to get more perfect chainline, in order to solve this issue. Assuming the bike has not had the BB replaced by you, it may be wise to ask the shop where it was purchased whether it is the original BB, and whether they will help with any chain line issues under warranty status. EDIT 2: It actually appears that belt "alignment" issues are directly related to belt tension with the Gates Carbon Drive belts. If the tension is correct, they track well. If it is too low, they will track toward the frame. Too high tracks away from the frame. 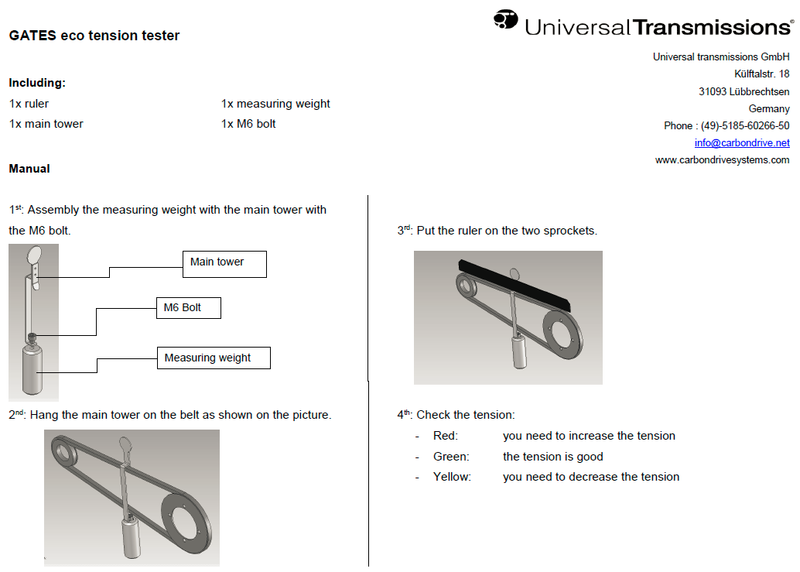 There is now an iPhone app to measure belt tension of a belt-drive. They say they are working on an Android app but this has to take into account the variety of microphones on Android phones. They will probably have to test and calibrate for each make and model of Android phone. Three months ago I bought an Avanti Blade 8C (belt-drive, Shimano Nexus 8-speed) and have had problems with noise in the drive train. Belt tension appeared to be associated with the problem. I downloaded the Gates Carbon Drive iPhone app and adjusted the tension so it vibrates at approx. 50 Hz and the noises have (almost entirely) gone away. This value falls in the middle of the range for internally-geared hubs (45–55 Hz) recommended by the app. So it looks like belt tension is very important in this setup. Today (four days later) I rode the bike to work and it is very noisy again. I checked the tension again using the iPhone app and it is now shown to be very low. This is puzzling because the rear axle is held tight with 16 mm nuts. There are also screws that provide fine control over the horizontal position of the rear axle and I used them last week to set the belt tension. Regarding the accuracy of the iPhone app, I get consistent reads on multiple attempts if I spin the cranks and flex the belt first. The strength of plucking will have very little effect on the frequency of vibration (like with a guitar). Sorry, I take it all back! I am totally confused about the noises my bike makes and they may not be caused by belt tension problems. Furthermore, I am getting inconsistent results trying to use the Gates Carbon iPhone app. I can’t get a consistent ‘twang’. The noisy bike saga continues. A belt-driven bike is not supposed to sound like a chorus of cicadas! A general rule for flat belts is to twist the belt midway between the front and rear belt drives, it should twist to 90 degrees with moderate two finger effort, if it goes past 90, then it is too loose, if you cannot make 90 without great effort, then it is too tight. This method depends on how strong your fingers are and the width and thickness of the belt, the more you use this method the better you get at judging what is correct for any given belt. Another method is to make small tension adjustments until the slippage stops. When a belt doesn't stay on a pulley it's either because the pulley are misaligned or the belt is damaged. You should check the wheel/axle alignment by checking the space between the tire and the seat and chain (er, belt) stays -- make sure the tire's centered between the stays. If not that then likely the belt has become damaged. Not the answer you're looking for? Browse other questions tagged maintenance belt-drive or ask your own question. How do I calibrate my auto tension belt?